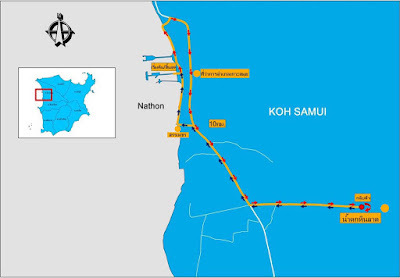 What looks like my last post of 2015 will be about the up and coming Samui Ride & Run 23rd & 24th January in Nathon. The website is all in Thai, but it looks like the 23rd January will be all about entertainment and the 24th all about sports. Check out their website here, their Facebook page here and their event on Facebook here. The 24th will see a 10.5km so called mini marathon, with start and finish near the Seatran pier in Nathon, with a 5pm start and participating will set you back 500.-THB. Ther ewill also be a 3,5km so called fun run, which will start at 6.15 and will set you back 400.-THB in order to be able to participate. 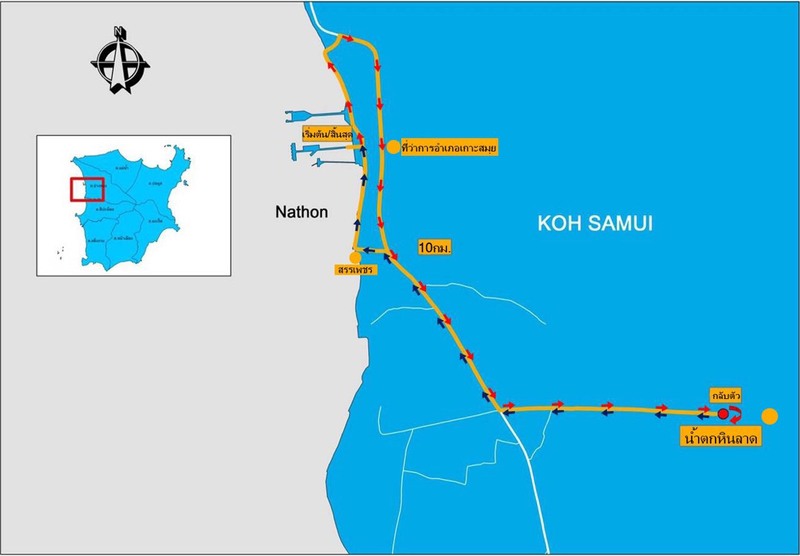 At 8am there will be a 32km bicycle ride, down to Hua Thanon with a big loop and back to Nathon. Participating in this will cost 500.-THB. It looks like there's a lot of preparation and enthusiasm involved and it seems to be well organized, so far. Unfortunately I won't be able to participate, since I should be on Koh Lanta on the 24th, and I should be doing a 3 hours and 20 minute run in preparation for a marathon on 14th February in Surat Thani. If you're on Koh Samui on the 24th January though, do sign up and enjoy the activities! The end of the year 2015 and the end of a month, it's time to say goodbye to December 2015. The last day of this year is knocking on our doors and I wish everybody a healthy and prosperous new year! The weather during this December was as one can expect during the monsoon, with lots of clouds, wind and rain. Nothing special there, except that the monsoon run longer than the previous couple of years. It has not been until the very end of the month that we started to see some sun back over the Koh Samui skies. It was a long, wet and hefty monsoon this year, that's for sure. Namuang waterfall 1 earlier this month, the calm and clean water has turned into a churning, wide and muddy stream due to the vast amounts of rain during the recent monsoon. It's not a safe place at the moment to swim in. During the beginning of the month I was for work in Moalboal in the Philippines, and upon arriving back I ran my second best half marathon during the 5th International half marathon in Bangkok, on and near Rama VIII bridge. Shortly after that event I decided to participate in my 3rd ever full marathon, on 14th February in Surat Thani. My training regime has started and today I finished my running year on a runners high by placing 5th in my age category during the 10 Miles International Hat Yai race in what is for me a good time (1:16'14.9). This month I visited my favorite Japanese restaurant on Koh Samui, for another excellent meal, at Kobori in Maenam, a great lunch was had at Sweet Sisters and we also visited the monthly Green market in Fisherman's Village. Tonight we will celebrate New Year in Hat Yai, providing we can stay awake (we got up at 3am this monring) and tomorrow we're off again, back to Koh Samui. Hope you have a grand time tonight and celebrate the end of this year and embrace the New Year, where ever you may be on this earth! Do 'like' my Koh Samui blog Facebook page and don't forget to use my Camille's Samui hotel recommendation blog and my Camille's Thailand hotel recommendation blog for all your hotel bookings on Koh Samui and around Thailand. By doing so, you will support my blog. Thanks folks! A late update today due to me participating in an International 10 mile new years run in Hat Yai and we just got back to the hotel room. Back here in Hat Yai it's also nice and sunny with a few scattered clouds with a current temp of nice cool 26C at 8.30am. My last run of the year went really well, 10 miles or in this case 'only' 15.27 km were completed in one hour and 16 minutes, which earned me a 5th place in my age category. The year finishes on a runners high! The forecast is looking very good, dry for the next couple of days but some very strong wind tomorrow but after that the wind should cease and very sunny skies should be ours with a very occasional shower being an option. The forecast has changed ever so slightly again, Friday may see some very strong wind but the wind may drop come Sunday and after the weekend, the partially clouded (and fairly sunny skies) may also carry some raindrops with them in the few clouds that will be around. It's the time of the year for 'Looking back at 2015'. A few days before year's end, since tomorrow we leave for two night in Hat Yai, where I will participate in a 10 mile run on Thursday morning as part of the New Year's Eve celebration, except that we start at 5am! It's been three and a half years ago that we visited Hat Yai for the last time and we're all looking forward to it! Let's start with January whilst looking back at 2015; For work I for a PADI IDC on Koh Lanta and once I got back home my Mum was here for a few months. The first half of the month was wet and the second half was nice and a lot sunnier. In February I had a PADI IDC on Phuket, with two ultra marathoners, a very special occurrence! On Samui I had a great dining experience at the 'Thai Experience' and we visited the 'Escapology' game, both in Lamai. Closer to home, at Wat Plai Laem a new sermon hall was opened. The weather during February was nice and very sunny with the temperatures slowly rising again. In March I was for work in Moalboal, Philippines, where I ran my fastest half marathon to date, one hour and fifty minutes at nearby Kawasan Waterfalls. I did miss out on the 3rd Koh Samui Midnight Run however! Weather wise, March was an excellent and nice and sunny month with hardly any rain at all. In April, whilst looking back at 2015, I was for a PADI IDC in Khao Lak. Koh Samui became world news with the car bombing at Central Festival and security on the island has been upped ever since. 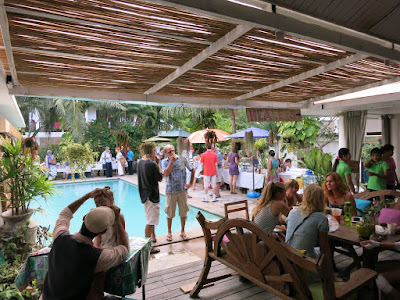 Songkran or Thai New Year was celebrated in Samui style and for food we visited plenty of times our favorite Japanese restaurant on the island, Kobori in Maenam and we enjoyed a fabulous brunch at Coast Bar & Grill, an absolute recommendation. Weather wise, ten weeks of drought were finished on Songkran day and a few more days of rain were had around the island, other than that, it was sunny! On to May and for work I found myself back in Moalboal in the Philippines. We attended a big wedding Samui style and the weather during May was a it of a mixed bag, with sunny days and tropical showers. For June I found myself with a home game for work on Koh Samui. I was on Phuket to run the Laguna half marathon for the fourth time and weather wise it was an average June with lots of overcast and showers besides the sunny days, they were there as well. Looking back at 2015 and we're coming into July and for work I was on Koh Samui, where I conducted a few PADI Discover Scuba Diving programs. A speedboat burned out in Bang Rak early in the morning and the Koh Samui schools had the yearly Kila Ampur. For weather we saw lots of strong wind and rain during the first half of the month and some more rain for the second half. In August I was on Koh Samui all month and I dived the 500th time at Sail Rock. The month started with sad news from Koh Phangan, where a 31 year old Thai woman died of a box jelly fish sting. Towards the end of the month I participated in the 8th Cancer Care run in Nathon and we attended the tenth anniversary of Sabeinglae restaurant. I also created a new page for tours around Koh Samui. The weather during August was not that great, plenty of rain and wind during the first half and end of the month and some sunny days in-between. September saw me also all month on Koh Samui and I taught an EFR course to a Thai friend who runs a nanny agency. The weather during this month was wet and windy again with some sunny days towards the end of the month. October saw me one more month at home, during which I looked after the children and the house whilst my wife was recovering from an operation she had last month. Very early in the month Samui was shocked by the death of a very young German girl who got stung by box jellyfish at Chaweng beach. This caused various actions by the local island governing bodies and experts were invited to and visited Samui and gave various seminars and trained people for box jelly fish prevention and awareness. I also gave a couple of presentations, among other at Zazen Boutique resort for their staff and for Samui dive professionals. It's still an actual situation around the Gulf islands and more action will be taken early January 2016. We also stayed two nights at Zazen Boutique Resort and had a lovely dinner and some excellent and relaxing massages there as well. When visiting Samui, a place I can recommend to stay at. 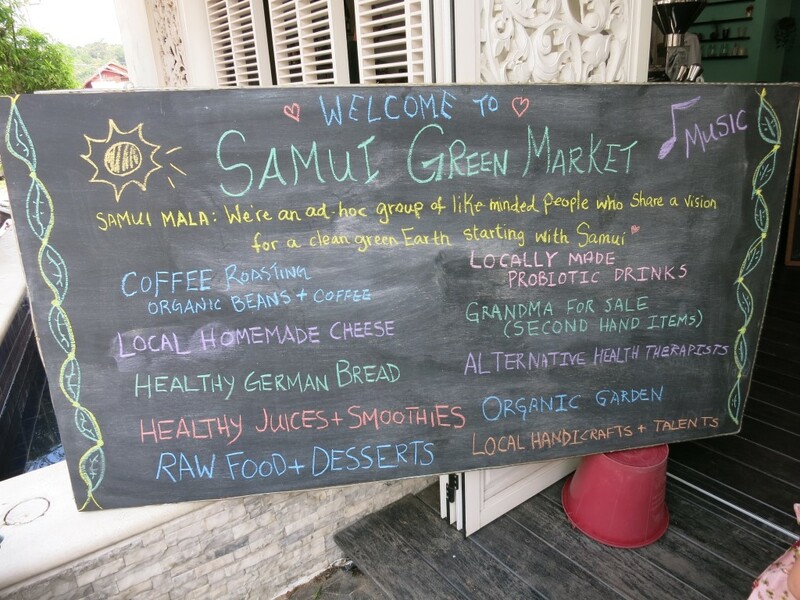 The Samui Green market is also back in business and we were happy to visit. The weather during October was not that great and we had an early start of the rainy season with plenty of rainy and cloudy days. During November I found myself on the road again for work in Khao Lak and in Moalboal in the Philippines. The last two PADI IDC's of the year for me. Now we are going towards the end of December and I went out to Sail Rock twice for another round of PADI DSD's. Upon returning from the Philippines I ran another half marathon, this time in Bangkok. The beginning of the month the weather was not that good, the monsoon period was extended but since a few days we have sunshine again. It has been a good year, since I was able to spend lots of time with the family, for work, I hope next year will be better. Looking forward to a healthy and successful 2016! 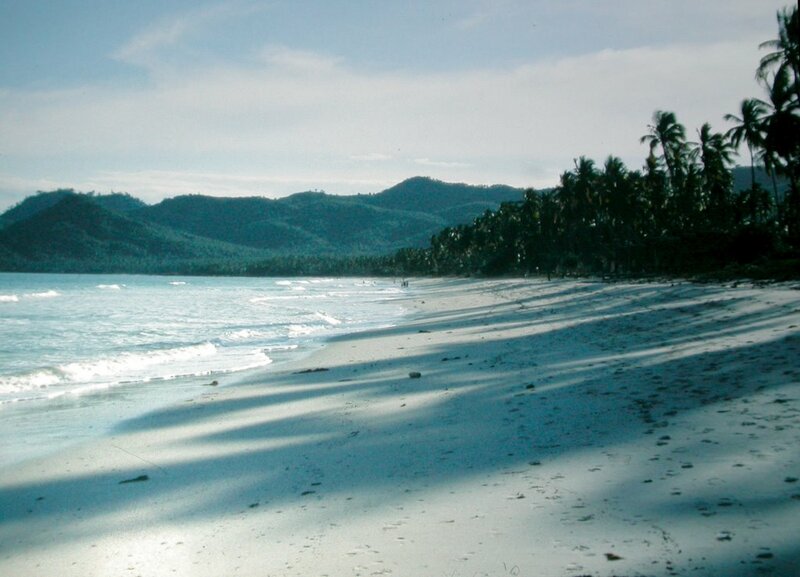 Greetings from koh Samui and see you next year. Yesterday there was a end of year party in Plai Laem and there was a sports event, with a football tournament, like each year and during the evening there was live music (with an excellent PA system by the way) and many prices were to be won. Two motorbikes, a fridge and a flat screen TV among others. It was busy and we plus the people at our table didn't win anything. The forecast remains very good, the wind will stick around until Saturday and maybe there will be some rain on Thursday and Friday but after the weekend we should have clear skies and no cool breeze anymore. The forecast is looking really good for the next ten days, mostly sunny skies, with some scattered clouds here and there, a nice cool breeze and almost no rain at all. Enjoy! A nice blue sky is shaping up over Koh Samui although it's a bit hazy this morning with a cool breeze. It should stay mostly sunny today. Current temp at 8am is 28C, still nice and cool. The forecast remains good, a nice breeze, sunny skies and hardly any rain at all until early next year! Go out and enjoy the beaches but be careful for undertows and rip currents, watch the flags on the beaches, and their corresponding colors, red means no swimming, so don't do it! Today it's the memorial of the Tsunami 2004, 11 years ago. The 2004 tsunami, a massive natural event that took the live of approximately 230.000 people along the coastline of Indonesia, Thailand, Malaysia, Myanmar, India, Sri Lanka, the Maldives and Somalia. Phuket, Khao Lak and Takua Pa and all beaches and villages in-between were hit hard in Thailand. It's amazing to see how Khao Lak has been build up again and how life goes on for the survivors, although they have been severely affected by the events 11 years ago. The forecast for the next ten days looks really good! Mostly partially clouded, meaning; sunny skies and occasionally a shower, maybe a bit more rain tomorrow. The monsoon really seems to have left so start enjoying the beaches and sights around the island again! The forecast is looking fabulous, sunny skies all the way into the new year, with just an occasional shower along the way. It does look like the monsoon is gone for this season. Nonetheless we had a lovely day around the island with a Danish family, enjoying some of the beauty that Koh Samui has to offer including a fab lunch at Sweet Sisters. The forecast has changed again slightly, and for the better. It should make everybody happy to know that as of tomorrow we should have partly sunny skies over Koh Samui until early January! It seems that yesterday may have been the official end of the rainy season. The forecast predicts a wet day today but it should start clearing up as of tomorrow with some occasional rain until the weekend is over, from this Monday onward it should be really nice, partly cunny and hardly any rain at all. 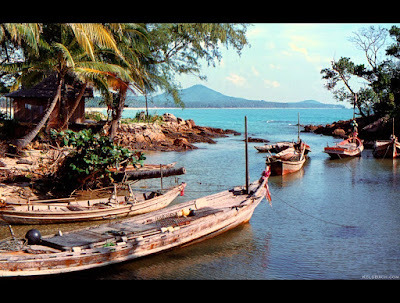 Last week I posted a picture of Chaweng beach in 1980 from a Tweet by Retro Siam (link can be found below first picture) on my Koh Samui Blog Facebook page and it got a couple of thousand likes in no time. 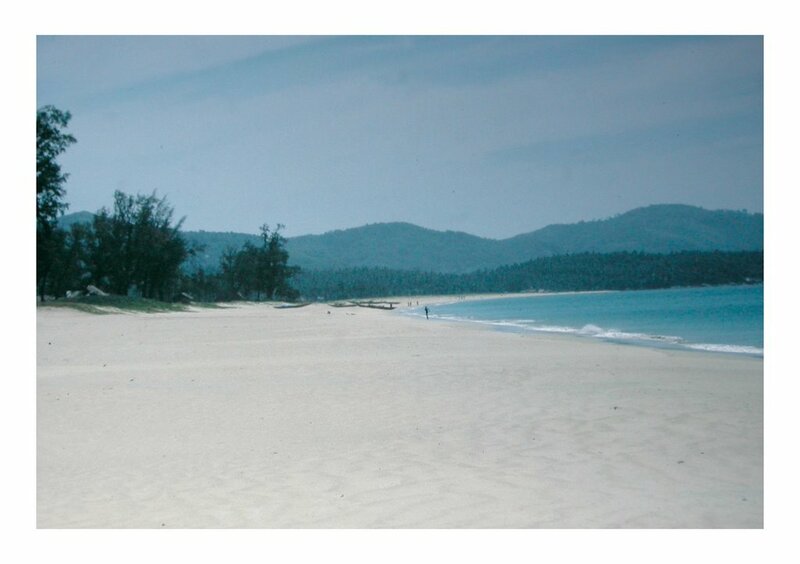 This was reason enough to check online for a few more pictures from the 8-tees and especially of Chaweng beach in 1980. A few of these pictures can be seen here. 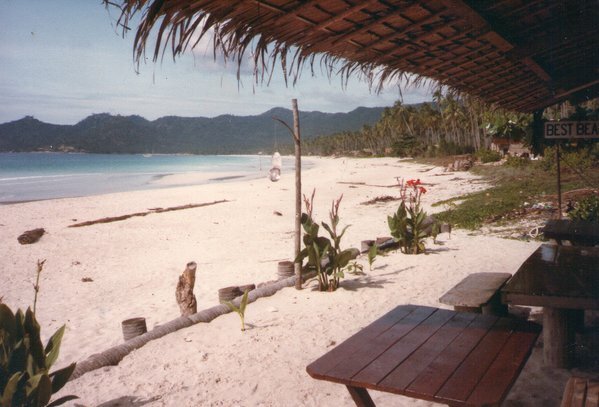 Having arrived myself at the end of 1999 on Koh Samui, my work, being a dive instructor, had me dive Chaweng beach on a regular base in early 2000. At that time I didn't appreciate diving Chaweng beach that much and now it's one of my favorite sites or rather THE favorite site around the island. Sadly enough, there is hardly any direct and convenient access to Chaweng beach anymore for diving purposes. Most resorts don't allow divers to pass through and the few public access areas are very inconvenient for logistics. The parking area is far away from the beach, making it very difficult getting the gear to and from the beach. As part of my job as dive instructor, back in my early days on Koh Samui, I was also working at Centara Grand Beach resort, where I spent hours on an end, watching over the pool and the beach. Hard work indeed! One of the good thing about diving on Chaweng beach, was the trash hat I collected over the years with underwater clean ups and various dive courses I taught there. The stuff I found over the years is stunning, from money and still in working order cameras and Go Pro's to about a hundred dive masks in all price ranges and conditions, to clothing (sunglasses, hats, shoes, you name it!) and bigger things like parts of jet ski's and sun bathing chairs. Chaweng beach in 1980 has changed, no surprise there. Some may not like it, but it's part of progress and the city that you live in has changed since 1980 as well. Important is how the change evolves and sadly that may bot always be for the better. 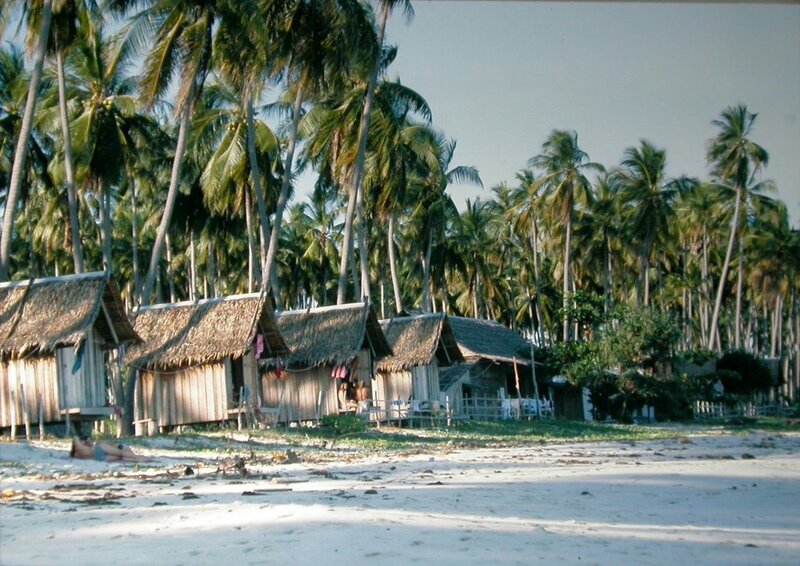 Especially in the early days, without the ecological knowledge and know how available today, resorts are build in different ways, which affects us all, ideally and hopefully in positive ways nowadays with the way new resorts are being build or should I say how they should be build? A unique feature of Chaweng beach in Thailand and for that matter, all beaches around Koh Samui, is that the resorts are build on the beaches and there's a beach road with no direct view onto the beach. Not many places or islands in Thailand have a similar set up. Koh Lanta and Khao Lak come to mind, where i'ts similar but most places or islands in Thailand have a beach, a road and behind the road, the hotels are build, like on Phuket. 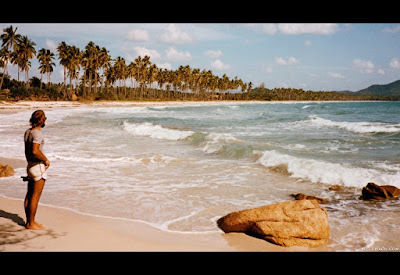 I do hope you enjoy these pictures though and also enjoy Chaweng beach how it is today, since in ten years time we will look back at how it is now and we will miss exactly that, what we have now! The forecast has changed a bit over the last 24 hours. The predicted hard rain and wind for today has kind of evaporated, it's still going to be wet but most of the rain has now shifted to Thursday and the storm like wind has completely gone. There will still be a fairly strong wind but not storm like as predicted a week ago. After the weekend it looks now really nice and sunny, so a dry and sunny New Years Eve may be with us after all. The forecast seems to keep changing for the better, small shifts are happening but tomorrow will be windy, cloudy and very wet, spilling over to Wednesday. Come Thursday there may be sunshine again plus an occasional shower and form there on it should be fairly sunny with an occasional shower, but the end of the year now looks nice and sunny and dry! We just got back from the Samui Green Market today in Fisherman's Village, having bought some delicious and healthy food to take home and sampling some of the good stuff on the spot. It's a small and intimate market with a lot of potential to grow and there's always some good and healthy food to be found plus various other natural and organic products, like handmade chocolate. They start to draw a good crowd and Samui Mala is doing a superb job of organizing the Samui Green Market today at least once a month. Since I changed my diet some 3 years ago and started paying a lot more attention to what I eat, organic foods are a lot more welcome and sought after in our house. Just a shame that organic food is almost always more expensive compared to the non organic version, as if you're being punished for wanting to eat healthy! At The Samui Green market today, there were some good deals and prices to be had though, another reason to visit! 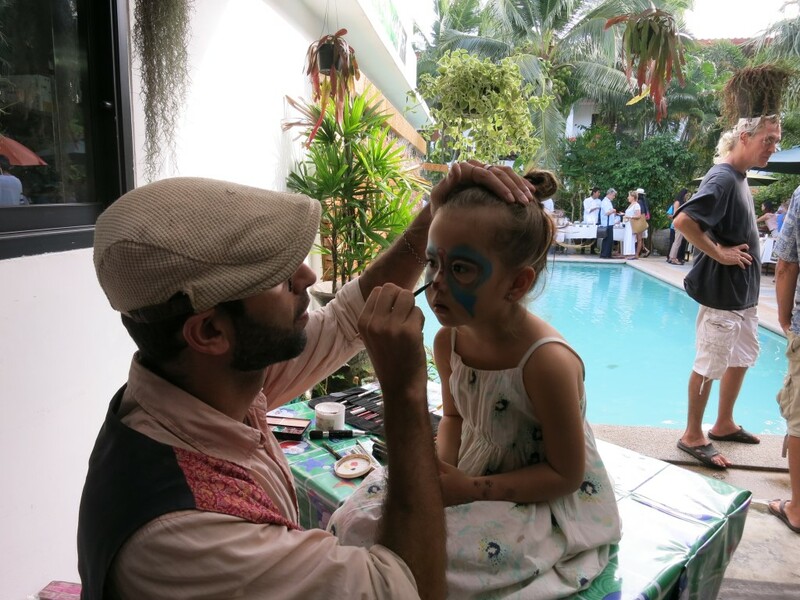 Face painting, always a fave with the kids! Stay tuned for more updates on my bog for next month's version of the Samui Green Market, it shold be roughly in 4 weeks time. 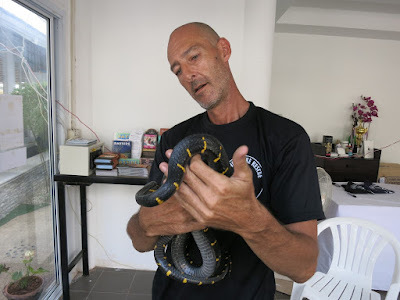 Phil of the Samui snake rescue with a rather rare Mangrove rat snake, which is rather mildly venomous, according to Phil, you will only notice and/or feel the fang bite! Due to it's colors and lines on the skin, it is easily confused with a very poisonous krait snake. 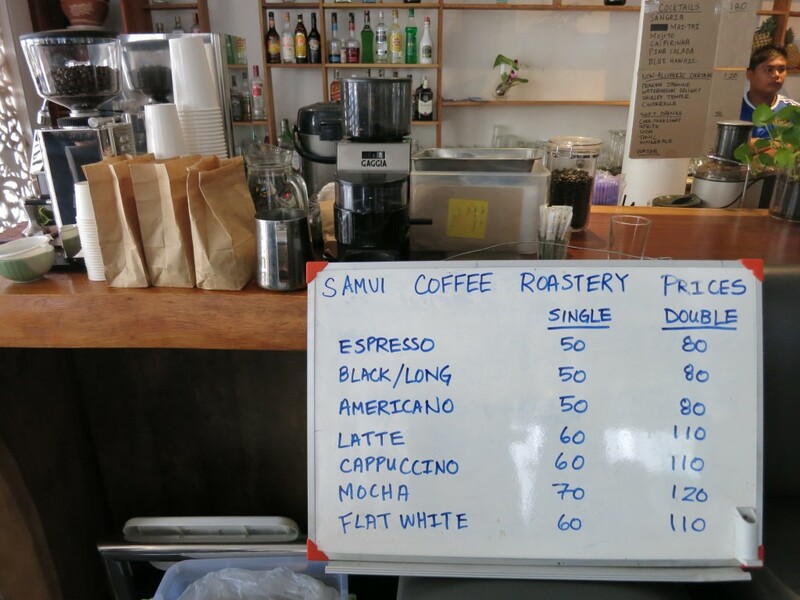 Sweet Sisters Cafe has always had a stand on all previous Samui Green Markets and today was no exception. 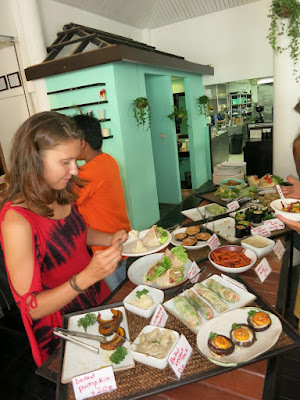 They had plenty of goodies on offer and it's well worth a visit in the South of the island, at Ban Bang Kao for some of the best lunches on the island. They're now open 7 days a week, just since last week. 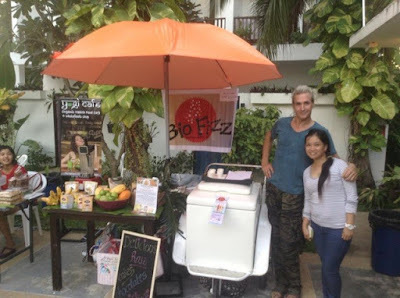 Hope you enjoy this entry and try to visit the Samui Green Market next time, Somewhere during January 2016, exact date still to be announced, watch this site! It's cloudy, cool and dry this morning around Koh Samui and it will most likely remain that way today. Current temp at 7am is 26C. 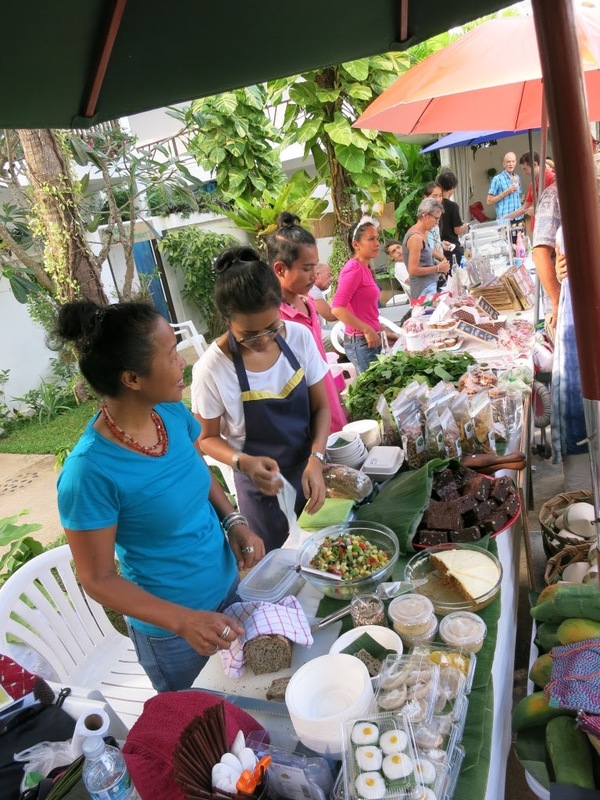 Don't forget about the Samui Green market at 3pm in Fisherman's Village today, well worth a visit for finding organic food and a few healthy snacks and drinks. The forecast changed slightly and for the better. the predicted storm for Tuesday and Wednesday seems to lose power each day, The predicted wind strength is not as strong anymore and for a much shorter time frame, there's still a lot of rain predicted but also in a much shorter time frame and from Wednesday onward it's partially cloudy skies with possibly a bit of rain and a nice breeze. It's looking slightly better again for the next ten days. The forecast predicts cloudy but dry days leading up to Tuesday when a (already weakened) storm is supposed to hit Koh Samui with lots of strong wind and rain over the two days. The strong wind remains, although not storm like but it may be fairly sunny mixed with rain showers. The rainy season seemed to have gone for a week or so but is back again and is seemingly staying on a bit longer than usual. The forecast predicts an increase in wind, clouds and occasional rain with a storm raging over Koh Samui Tuesday and Wednesday with lots of hard wind and rain after which we see a short lull and then the rain and wind seems to pick up again towards the end of the year. The Samui Green Market, Sunday 20th December at Fisherman's Village is knocking on the door. 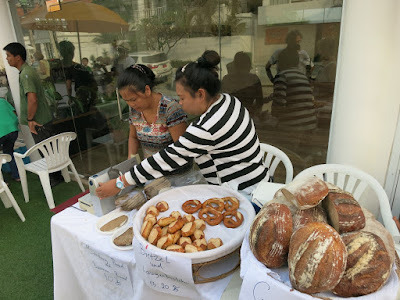 Don't miss out on this friendly and healthy event, where you will have the opportunity to purchase many organic produces, from bread to meat and many other non food products as well. Plenty of healthy snacks will be available for sale, now we only need some sunshine for the day! Due to my recent visit to Bangkok last weekend, here's another update on the Food on Wheels series; Food on wheels, refreshing fruit in Bangkok. All around Bangkok you can find food on wheels variations, but the busier the area, the more options will be available and can be spotted. The tourist areas around Bangkok, like Sukhumvit Road, Khao San road and similar well known spots around the city, also sees a high density of food on wheels carts in all kind of forms. From big to small push carts and all the way to motorized bikes and everything in-between or sometimes even bigger. You can easily fill a day trying to look and spot the various vehicles that are being used. They come in very handy however and they must do a reasonable amount of business, although on the other hand, competition is stiff and at each sky train stations along the busy downtown track, various carts with different food and/or drinks are waiting for you at each station. One of my first memories from my first visit to Bangkok is finally having the courage to stop a fruit cart and order some pineapple. This was the very first time I had fresh pineapple and I remember my first taste as being an explosion in my mouth! I never had such fresh and sweet pineapple before in my life! This was the beginning of life long list of orders from street food, varying from fruit to full meals, when in Thailand or surrounding countries. Besides Thailand, I also enjoyed food on wheels and/or street food in Indonesia, Malaysia, the Philippines, Vietnam and South Korea. Hope you will also find the courage to stop a vendor and go and buy some fruit and hopefully you will enjoy it as much as I did and still do and take it from there to discover the seemingly endless options of food available to you! The forecast changed slightly, later today the wind will pick up and in general it will be fairly cloudy. The massive storm predicted for the 22nd and 23rd has now run a bit out of steam and it's only at the 23rd might have strong wind but there are still lots of rain expected on the 22nd and 23rd. This will fade really quickly though and we may have a nice and sunny Christmas. A blue sky is shaping up around Koh Samui this morning with some thin cloud layers in it that most likely will evaporate once the sun heats up. Current temp at 7am is 26C, nice and cool. Yesterday saw a sunny day around Koh Samui with occasionally a cloud drifting in and out. Max temp reached 33C, it felt really warm. The forecast indicates that as of tomorrow we can expect cloudier skies, the wind picking up and around the 22nd and 23rd a storm like weather can be expected with lots of rain. The forecast is looking but come Thursday clouds are moving in and the wind is picking up with 23rd December a freak storm in sight with very strong wind and lots of rain. Let's see if this will hold up or fade again once we get nearer to this day.